Hurawalhi Maldives has celebrated its first Snorkelling Day on July 30. Weather and ocean conditions were as perfect as they can get, allowing the resort’s guests and team members to have a fun-filled Sunday on the ocean. To start off the day, team members were invited to go snorkelling to the famous Kuredu Caves, a.k.a. Turtle Airport. This spectacular site, which is suitable for snorkelling as well as diving, never fails to impress, and the team was rewarded with five green sea turtle sightings; amongst them were two small juveniles, both quite shy and obviously taking an easy Sunday morning pace. In the afternoon, the team headed back in the direction of sister property Kuredu Island Resort and Spa, this time stopping on its house reef. After swimming with a multitude of different fish, the team encountered the familiar, resident green sea turtle Zippy. 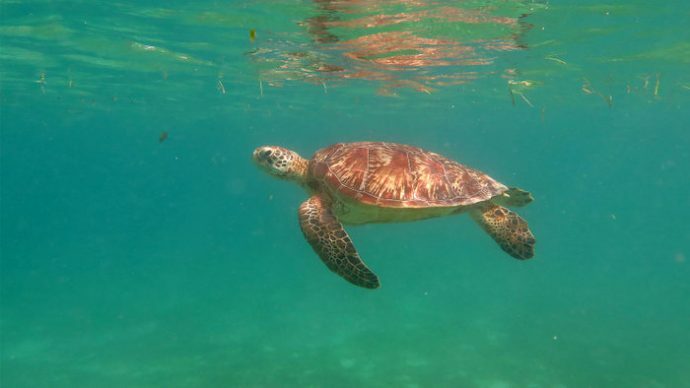 “While sea turtles can hold their breath for several hours, Zippy appeared to be quite inquisitive and popped its head through the surface to take a look at group twice,” an announcement by the resort read. 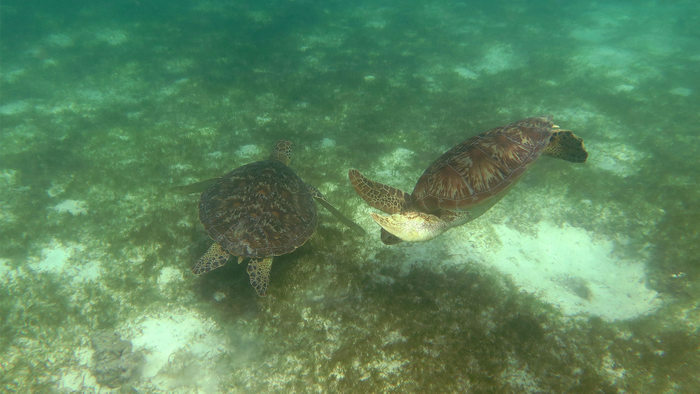 According to Hurawalhi, amongst the four turtles that greeted the snorkelling team, there was a newly identified juvenile green sea turtle as well. For the time being, it is being referred to as GRNew36. Turtle tours are regular events at Hurawalhi, and guests can book their own turtle tours for USD 79 per person. Officially inaugurated in January, the five-star Hurawalhi is home to the largest undersea restaurant in the world, and offers 90 villas including 60 Ocean Villas and 30 Beach Villas for grown-ups who are seeking luxury and innovation. The villas are stylishly and beautifully conceived featuring soothing décor, sumptuous linens on king size beds, bleached wooden floors, and private terraces with panoramic views.